We've heard from several of you that Kelly Parker used to send out email regarding last-minute fare sales from the cruise lines, and that you'd like us to do the same. Today we have a preview of Royal Caribbean's Going, Going, Gone! sale from Oct 11-12. If you are a Crown & Anchor member, you can book Oct 10. We look forward to hearing from you soon, 425-827-5656, or toll free, 800-275-9876. 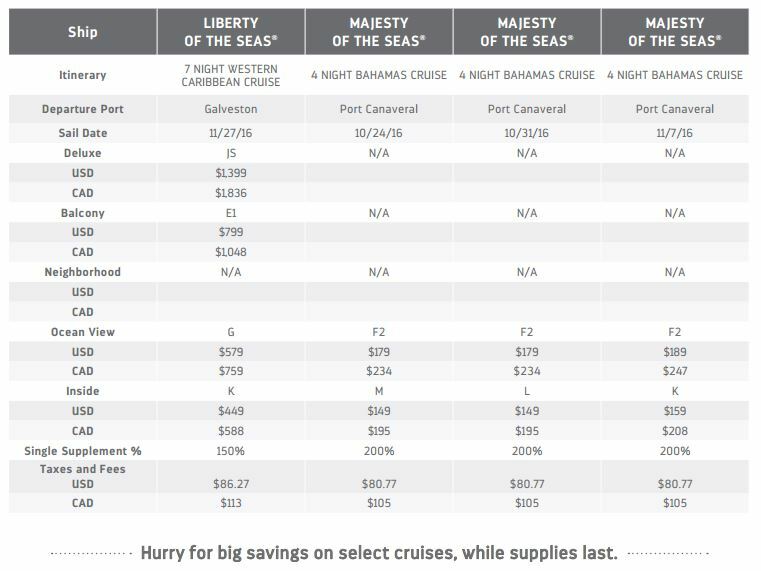 Royal Caribbean has posted 19 itineraries they are trying to sell out. A selection is below, but click this link for the full list. Departure ports include Ft. Lauderdale, Galveston, San Juan, Tampa, and Orlando (Port Canaveral). Sale runs Oct 11-12 only! For you solo travelers, note that many of the single supplements on these itineraries are 150% of the fare...we priced out an ocean view cabin on the Rhapsody of the Seas, Dec 10 departure from Tampa on a 7-night Western Caribbean cruise...total of $727.52, for one person! Wow!